One of the easiest way for a beginner to start playing songs on a guitar is by strumming chords and singing along. This method doesn’t take a lot of time to learn and you don’t need to be able to read music to do it. If you can read chord diagrams or know the basic guitar chords in the first position, you’ve got all the knowledge you need to be able to play literally hundreds of your favorite songs. A guitar chord is three or more notes played together. Basic chords in the first position are the chords beginners learn right away—chords like G, A, C, D, E, F and B. Other beginning chords are Em, Am, and Dm. There are seventh chords as well. 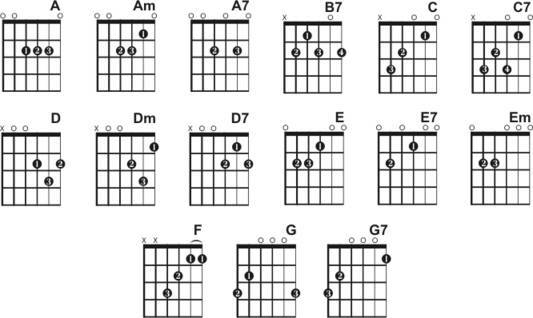 This might sound like a lot to learn, but if you take a look at the basic guitar chart below, you’ll see that it isn’t a lot of chords to memorize, and after you’ve learned how to make these basic chords, you can easily start to make more advanced chords. You can purchase a chord book or find a chord dictionary online, Better yet, grab one of the many chord apps for your phone or tablet and access chord diagrams any time you want. Chords guitar songs are arrangements of songs that have the necessary chords in a song placed above the lyrics (words) to the song. The chords might be in the form of chord diagrams or they could just be the chord names. These arrangements are as basic as it gets and ideal for beginning guitar players who want to play something right away. The example below from the Eagles song “Lyin’ Eyes” shows you three ways to look at a chord. The first way is the chord diagrams over the music staff, the second is the chords written out on the music staff, and the third is the chords written in guitar tab. You can use any one of these methods to read chords. If all you can find is a piano/vocal version of a chord, it will usually have chord diagrams written that a guitar player can use to play along. 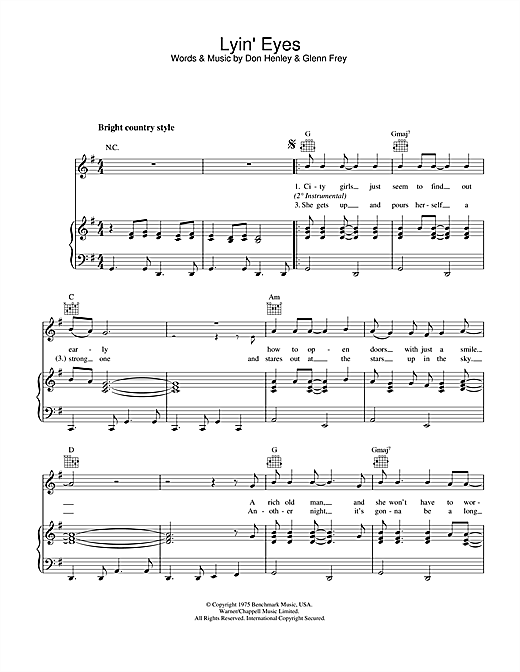 Look at the piano vocal version of “Lyin’ Eyes” below to take note of the chord diagrams. Chords guitar songs are readily available online, so no matter what you want to play, there’s a good chance you can find it. YouTube is another great way to learn to play songs using just the chords. There are lots people who teach individual songs and teach you how to play the chords and show you strum patterns. However you learn, it’s fun to build a repertoire of songs to play.